If you’re looking for disposable Halloween party supplies, these products are a great place to start. In addition to use in restaurants, many of these disposable items are also ideal for catered events, like weddings and funerals. From pie servers and table covers to tongs and dinner napkins, you’re sure to find everything you’re looking for. 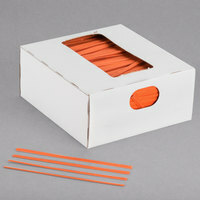 For related products, check out our straws, napkin bands, and placemats. If you're wondering where to buy bedford disposable halloween party supplies, we have a large selection of bedford disposable halloween party supplies for sale at the lowest prices.